It's that time again! 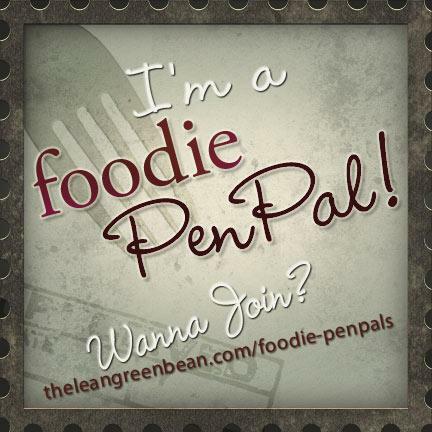 Time for the monthly Foodie Pen Pal Reveal! This month my package came from Dena, over at 40 Fit in the Mitt. Dena had such a busy month with a Blogger Retreat in Boulder, Colorado. Check out her blog to see her adventure! With all she has going on, she still had time to put together an amazing box for me! Edamame was the first item I found in the box. I was so excited! I have always wanted to try Edamame, but never seem to get it into my shopping purchases. The dry roasted version was delicious. I loved it, and look forward to having it again. Thanks for introducing me to the snack, Dena! Next, I found a box of Penne Rigate that is low in carbs. I am looking forward to trying this as I love my pasta's! Muesli is new for me to, and it is tasty! I have been sprinkling a bit on my greek yogurt for a delicious breakfast. Rice Crackers were new to me as well. I was a little hesitant at this new treat, but I really do like them! Dena also sent a bag of Egyptian Chamomile tea. I have yet to try this, but I look forward to it! Dena also included a lovely assortment of recipe's and coupons! Who doesn't love coupons?! Thank you so much Dena for introducing me to such tasty items. You made an amazing selection, and it was so appreciated! Awesome, I am so happy you liked it! The tea is really nice at night, it's a calm relaxing tea. So glad I got to meet you and look forward to keeping up with you and your blog. Lovely meeting you Dena! I will let you know once I try the tea. Sounds like it would be a good end to a stressful day.